Was listening to ESPN Radio as I was driving yesterday. Not sure who the guy was but he said after looking at lots of tape the only top 10 prospect that did not excite him was Bosa. He just did not see enough great plays from him that other blue chip guys have. And that was looking at 2 years of tape. He also said many NFL scouts agreed with him. So that may be the guy that drops. The guy that causes me to pause is Rashan Gary. Most people have him as a top 10 pick but his production on the field isn't even close to that. Yup, I don't get the infatuation with Gary...he has bust written all over him. I think they're massively underrating him. I think he's comparable to Harold Landry last year, a guy who draftniks said similar things about. He's the most natural pass rusher and the most polished pass rusher in the draft. He's not a 3 down DE, but he can always add strength, you can't teach those natural instincts for rushing off the edge. Agree on Burns. He's not just a run around the tackle defensive end. Burns has a nice array of moves and uses his hands well. We didn't draft Clay Matthews with the idea that he would be great to drop into coverage. Only knock that I've seen that looks legit is that he's not great against the run. Going from 220 to 250 should help. I would be ok with gary at 30. i don't like burns, i don't know if he can keep that weight on and i see him getting pushed around. i prefer ferrell if that's the direction - ie pass rusher...he's more stout and will be better against the run, so he's on the field for more downs, ya, we have 2 fa's that are similar, but i see no problem adding ferrell to the mix. matter of fact, ferrell or oliver are there at 12, take em. when burns is on the field, you would almost be tipping that a type of defense is being played, you could audible and run right at him, with a few fatties tying him up, no thanks at least not at 12. NFL Draft Network's "Draft Machine." Agreed. Hock and Fant are 1A and 1B depending on what you want them to do in your offense. If you want an all around very good player who needs to be able to block, it's Hock. If you want a big athletic specimen that can rip the seam but isn't counted on to help on running downs, it's Fant. Hock is going to be a really good player in the NFL, he's a complete TE and better overall than Fant. That said, I think for a team that is built around Aaron Rodgers arm, I think weapons in the passing game are key and Fant is just a better receiver. He's a more natural athlete and a more natural receiver and would give GB more options. Having allows you to player 12 personnel (with Graham and Adams in Slot, Fant and GMo outside) more often and forces defenses to either play Dime, opening things up for the running game and allowing Graham/Fant to bully smaller DBs OR they play Base/Nickel and either Graham or Fant are matched with a either a CB they can bully or LB they will run by. With the amount of play action MF will likely use I think having Fant creates more headaches for DC's and Safeties. 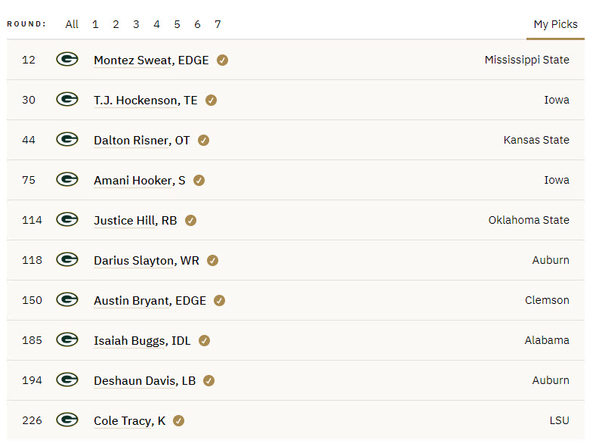 Wouldn't mind seeing the Packers address another position at the end of round 1 other than TE, and perhaps get Irv Smith in round 2 even if it means packaging picks to move up a bit. Really holding out hope this is G-Mo's year to break out. He's very physically gifted...time for an OC to put him on the right seat on the bus to let him deliver. Make a pick at 12. I think there will be a impact player available at several positions, albeit mostly defense. #30 can be trade bait if the draft happens to fall just so. Assuming, of course, an offer that can't be refused is made. I hope MLF and Gute's crew start bringing in viable QB prospects, so a mid-round pick for one wouldn't be that surprising. I recall during the Holmgren era when we (essentially) had starting QBs as backups, and would like to get back, or closer, to that. Even though we hope ARod will play for several more years, it's becoming too risky from an injury standpoint to continue with the Hundleys of the league. Even a relatively minor injury that could knock him out for 2-3 games could make a tremendous difference to a season that can't afford to be "wasted". I don't know that Kizer or Boyle are capable of that, much less a 6-8 week stretch. If it comes down to having a better blocker or a better receiver at TE, give me the blocker every time. Not to say I want Donald "Roberto Duran" Lee (he wasn't even that good of a blocker, as I recall), but protecting ARod and supporting a transition to a more balanced offense are higher priorities. I agree with whoever said (paraphrased) that Graham and Lewis are likely, or are at, the end of their careers, and that drafting for the future at that position is a good idea. Either of the Iowa boys paired with Tonyan would be a pretty dynamic tandem. Strictly my opinions, others may vary. Or when we had Matt Flynn as a backup. He kept us competitive. Another bad "read" on QBs by MM. All I recall is there were pancakes involved. Fun Fact: Matt Flynn has as many wins as a starting QB as Brett Hundley. Brohm was a 2nd round pick. Same reason Kizer is still the backup, we traded away a now starting Safety to acquire him, that means he gets extra time to justify it. 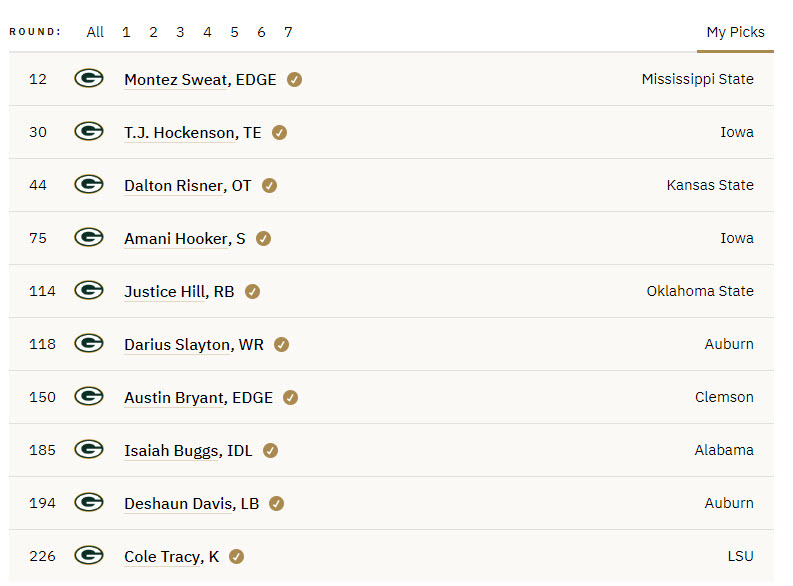 I think Hockenson is a top 10 talent... maybe closer to top 5. I also like Jace Sternberger at TE. He's probably a R2 guy but if GB can get him in R3 that could be a steal. Also, don't sleep on Tonyan. That kid can play. A kid I think we can grab late who is relatively unknown is Kahale Warring from San Diego State. Josh Oliver out of San Jose State gets a lot of pub, but I think Warring is going to be a better pro. He only started playing football his last year in high school, plus he went to school in a really rural area. I think we can get him in the 5-6 round easily. I have a feeling on offense we are going to discover a whole lot of guys we never knew could play. Except on the OL. Spriggs is still a turd merchant. I'd still prefer him over Bosa. I think Bosa is really overhyped. Another guy to look at for TE is Isaac Nauta of Georgia. The accounts I've read say he may be the best blocking TE in the draft. He can be available into the 5th round, as well. Spiggs comes out of NOWHERE! Starts playing like a young TJ Lang!!! Another 4-5th round guy is Foster Moreau from LSU. Came out of nowhere to be named outstanding Senior Bowl Week TE. Showed more athleticism at combine than people thought he had. Just read Pro Football focus top 250 players. They are a whole lot different than everyone else. Jerry Tillery is top 10, Risner is top 20, Ferrell is #35, and Fant is at #43. Interesting stacking of players. Montez Sweat at #46, and Rashan Gary at #48. Come on. PFF? Enough said. They think Haha is a great safety. Yeah 4.58 40 and 38” vert, kid definitely has athletic potential. Just a raw athlete needing some molding. Seeing more and more things that make me want GB to take Dalton Risner. Don’t care where, even if it’s at 12. Kid is underrated as a Tackle, I think he could be really good anywhere they put him in the line. Nasty finisher and a very successful Tackle actually. I think he’s a guy they could stick at either Guard spot in 2019, figure out Bulaga’s future next year and whenever RT opens up just slide him over. I get a real Andrew Whitworth vibe from him. I agree, my favorite o-lineman in this draft. I hope they don't fall for the Metcalf hype at #12. He looks like someone that's gonna be plagued by one injury after another. We have enough of those guys. Isn’t the WR from Ole Miss actually a better player with higher upside? KC drafts at 29. Do they need a CB? I don't think you can look at JJ's rookie year and determine the future of his career. Coaches routinely talk about the jump from year 1 to year 2. The kid has instincts and the tools to get it done. I think he hit a rookie wall too. He looked really good early on, then faded as the season went on. He reminds me of David Boston. Too muscular. While a great 40 was slow with the agility drills. I agree - no thanks. Metcalf is an enigma, How can a guy who runs a blazing 40, has a great vertical & bench post agility numbers worse than Tom Brady's? The more I read up on prospects I think this guy could be the real deal. You never know in the draft but really good tackles do not grow on trees and you need to take one in this spot. To me you truly build a team from the inside out and don't think you can ever pass up a OL given the chance. If he had benched more than 23 reps I don't think there would be much of a discussion about him at 12. I think he compares favorably to Quenton Nelson in terms of size, football IQ, and attitude, but Nelson put up 35 reps at the Combine which shows up on the field. If Risner had put up 30 reps I think he would be an easy pick in the teens. He will be a 24 year old rookie also, so I think that hurts him some.